The Kellogg School's Marketing Department has redefined its discipline through the efforts of many exceptional professors. 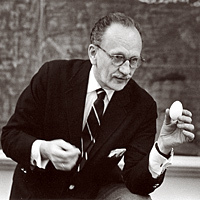 Above, in this photo from the 1960s, Professor Steuart Henderson Britt, with the help of an unlikely prop, appears ready to reveal another insight into consumer motivation. He calls it "the four pillars," and when Dean Dipak C. Jain talks about the design that has become the Kellogg School's educational architecture, his passion for the framework is evident. "We take a holistic approach to leadership," Jain says. "The global market is far too complex and competitive for anything less ambitious. Our students gain an advantage by digging deeper to learn more while also having opportunities to put that knowledge into action immediately." Along with this commitment to creating an academic environment where intellectual depth is prized, encouraged and enabled, Kellogg also believes that experiential learning, global perspectives, and leadership and social responsibility play critical parts in its graduates' development. These four pillars are situated in a context of innovation, inclusion and collaboration, Jain adds. In future editions, Kellogg World will offer a closer look at each of these pillars. But here we examine how one aspect — intellectual depth — has cultivated pathbreaking Kellogg research while giving students the tools to understand not merely what happened, but also how and why it happened. "Our faculty, literally, write the books on the subjects they teach," Jain says. Indeed, Kellogg professors have been pioneers in many areas and have produced knowledge that has expanded the boundaries of their disciplines. Whether it is Philip Kotler's prolific output, which has reshaped the very concept of marketing, or textbooks by David Besanko, Robert McDonald, Sunil Chopra and Lawrence Revsine (to name a few) that have done the same for strategy, finance, operations and accounting, Kellogg has been leading the way for a century. Today, the school builds on this tradition with cutting-edge research in such areas as leadership, crisis management and neurofinance. The following pages present just a fraction of the intellectual depth that has distinguished Kellogg since 1908 and turned the school into a global management education leader. As Dean Jain says, "From here, we go on to new heights."